Parents took kids out of school, adults called in sick. All for a Giant Parade! Our television sets at work were glued to the live telecast. One woman was actually whooping it up as we watched. Nobody complained. 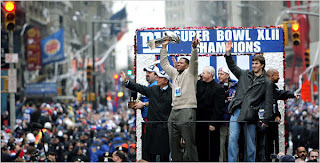 The New York Giants were all stars on Broadway today.